While everyone is busy with their own stuff and worries these days, less people care about others or they do not care or realize any small or big harm they cause to someone else in the process. But there are people who think to that length, keep track of things and also do care about others, specially do care, that do not harm anyone else in the process. Even if they do harm by mistake, they go out of the way to compensate it, even if the harm they have caused as minor, as it can be ignored. 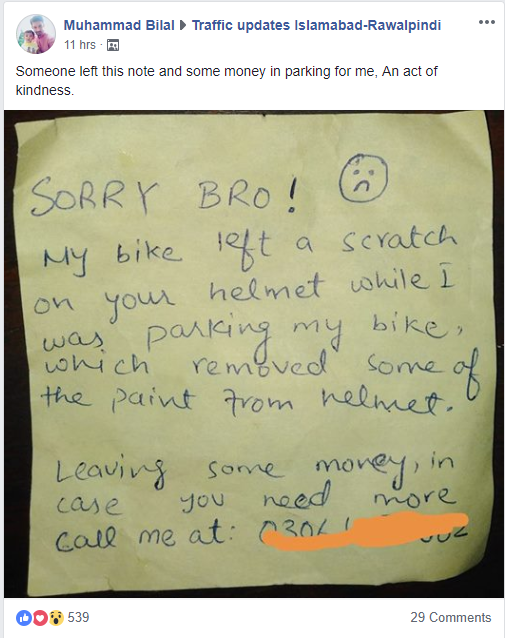 One such story was shared by a Facebook user by the name of “Muhammad Bilal” on the “Traffic Updates Islamabad/Rawalpindi” group, where someone mistakenly left a mark on his bike helmet, while the person was moving his own bike, so he not only left some money to compensate with a sorry note but he also left his mobile number in the note, so he can be contacted, in case, the owner thinks, money was less than it should have been. Note he left, as shared by ‘Muhammad Bilal’ is as follows. What a gem of a person and this act of him, was clearly much liked by people and appreciated by commentators and rightfully so. But, it not really about those likes and comments, in this society we need more people who actually care and think, if they are providing any harm to anyone while they go through their daily life errands. Do like our page on Facebook and follow us on twitter for useful and thoughtful stuff and information from Pakistan.